Total oil production in North Dakota increased by 2 kbo/d to 1029 kbo/d in July, after a drop of 20 kbo/d in the previous month. I only show the production from horizontal wells, and because conventional production is just 30 kbo/d in North Dakota, the total production shown here is a little lower than the official report. The trend is the same, and you can see the small uptick in July. The 45 wells that started flowing in June, had an extraordinary good 2nd month of production in July. You can see this in the “Well quality” graphs, where I show the performance of wells since the beginning of 2015, grouped by the month in which they started. Especially the wells of Marathon and Whiting performed very well on average; Marathon had one well (Juanita USA 13-35H) that did much better than the rest of the pack, producing 2175 bo/d in July (Since 2005, only 3 other wells have topped that in a particular month, in ND). The 45 wells that started flowing in May, also had a good start; quite a bit better than the averages in the months in the beginning of this year. These factors, together with a somewhat smaller than typical decline in legacy production, caused the small uptick in July. The DUC count hasn’t changed much since February, as can be seen in the “Well status” tab, when you select only the “2. DUCs” (or also incl. the “1. Spuds”). EOG has shown the largest increase in production, since it started to complete wells again in the 2nd quarter of this year. This can be seen in the last tab (“Top companies”). I now use the annual reports from the NDIC to adjust & correct the past production of wells. Typically, changes are not large, but for confidential wells this is useful, as only part of their production (that which is sold), is reported when in confidential status. The difference between the total oil production I report, and what the NDIC reports for these wells, is now < 0.01%. Next week Friday (September 23rd), I plan a new post that contains several more advanced analyses. If you wish to subscribe to new post notifications, please click here. How should we think about the NGL production? Your presentations now include natural gas separately from the oil production. Is NGL production to be thought of as a part of natural gas figures? Or, is it a “third stream” that is unknown, from the point of view of these presentations and that needs to be estimated and added to reported natural gas and oil figures to obtain the total production, and ultimately the EUR, etc.? Would the answer depend on the basin – perhaps, due to the reporting differences? Here, I am commenting on your North Dakota update, where NGLs are of comparatively little significance. 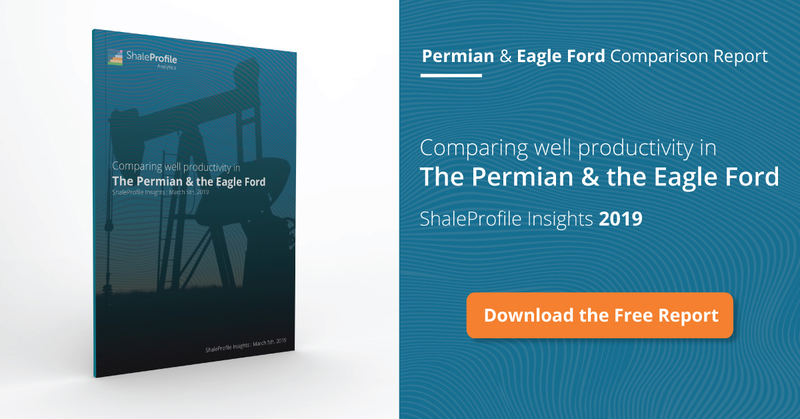 I am more worried about whether NGLs should be added-in separately in, say, Texas – when analyzing data from the presentations for all of US or just the Permian updates. This has mystified me for some time. I would appreciate any clarification. The folks at North Dakota’s DMR specifically addressed this issue, and explained it with text, pictures, and diagrams, on pages #29/ff in their most recent presentation, ‘Cookfest’, July, 2016. Essentially, all gaseous hydrocarbons are separated from the oil component at the wellsite (pad), or central battery tanks (processing/storing nearby multi pad production). The gasous component is meticulously measured and the volume, in increments of MCF, reported to state regulators. This number is the gross number we all see. (Ohio makes VERY clear they do not segregate NGLs from Gas Produced numbers). The processing plant that receives the gas is responsible for reporting both the sourcing entity and specific compnents (ethane, butane, propane, etc), and the amounts of each. This is where revenue considerations loom large as the processors can play a role in selling these products to various downstream entities for varying amounts of money. Taxation, royalty payments, and other factors can cause tension when operators own some or parts of these midstream facilities. (Chesapeake, in particular, is currently embroiled in intense litigation over this in the Appalachian Basin). In addition, some gas processing plants only provide partial separation of the gas, such as stripping out the methane only, and forwarding the balance to other plants for additional processing. Thank you, Gerard and Enno! I follow what the reporting definitions for each of the 7 (soon 8) states that I cover. Each of these 7 report oil & gas seperately. Some states also report a 3rd condensate stream (Pennsylvania & Texas), which I add to the oil production, while other states are clear that they include condensate in the oil production numbers (ND & MT). I belief that all these states report all hydrocarbon production, so there should not be anything missing from what I present here. However, how exactly each of these states deal with NGLs, I am not sure, and I hope someone else can comment on that. I suspect that most states include NGLs in the gas production numbers, but it would be good to get confirmation on that.